If you are an adventurous hiker, rock climber or if you like traveling, perhaps you can consider this Finnish company, Suunto’s X9i watch. The Suunto’s X9i is designed and featured with all the necessary tools that you required for hiking, traveling, climbing, skiing, etc. X9i digital watch comes with GPS, a compass, chronograph, altimeter and barometer. The GPS measures speed, distance, routes, waypoints and tracks position. With altimeter, users can get to know the altitude and vertical speed. Users can use barometer to indicate sea level pressure, absolute pressure, weather trend graph, temperature and also weather alarm. This watch is water resistant to 100m or 330ft. It has a PC interface software and able to link its data to PC via an USB cable. 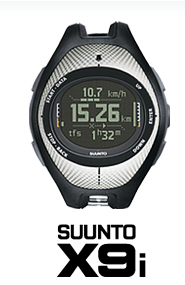 What is new is that Suunto has just released the free software to export and convert the tracks recorded on the GPS in the watch so that it can be imported into the free version of Google Earth. Google Earth will display your route anywhere on the globe using its real satellite imagery. You can thence show off to your friends on your last trek and tell them how tough you are!